Next weekend, Pope Francis will make his first visit to the home of Asia’s largest Catholic population, the Philippines. The pontiff, who also will be making a stop in Sri Lanka, is very popular in the Philippines and should expect an enthusiastic welcome during his five-day visit. The Philippines’ Catholic majority has its origins in the islands’ long period as a Spanish colony, and popes have made the more than 6,000-mile trip from the Vatican a few times before. Pope Paul VI visited the country in 1970, and St. John Paul II traveled to the Philippines twice as pope (in 1981 and 1995). 1Very few countries are home to more Catholics than the Philippines. As of 2010, there were about 76 million Catholics living in the Philippines – roughly the same as the number living in the United States. The two countries have the world’s third- and fourth-largest Catholic populations, behind Brazil and Mexico. About eight-in-ten Filipinos (81%) are Catholic; a somewhat smaller share of Filipino Americans (65%) identify as Catholic. 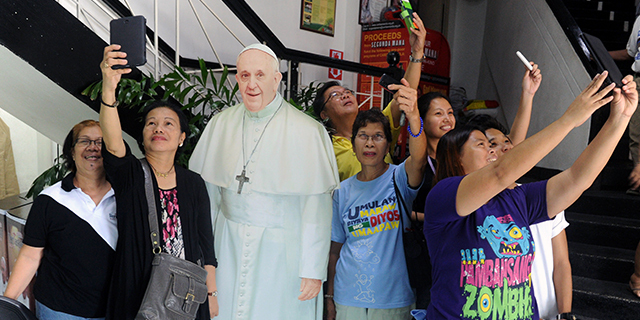 2 Pope Francis is extremely popular in the Philippines. Nearly nine-in-ten Filipinos overall (88%) – including 95% of Filipino Catholics – say they view the pope favorably. In fact, more than half of the country’s people (56%) view Francis very favorably. 3 Pope Francis plans to visit Tacloban, a city devastated by Typhoon Haiyan in 2013. Later this year, Francis will reportedly focus on environmental issues and publish a papal encyclical urging action on climate change. About a third of Filipinos (34%) see pollution and environmental problems as the greatest threat to the world; no other problem mentioned in the survey (including religious and ethnic hatred and nuclear weapons) is viewed with such alarm by as many people in the Philippines. 4 Many Filipinos have conservative views on social issues, some of which are strongly in line with Catholic Church teachings. For example, two-thirds (67%) say that getting a divorce is morally unacceptable – three times the share of Americans who say this (22%). Filipinos overwhelmingly view having an abortion as immoral (93%); no country among the 40 surveyed is more universally opposed to abortion on moral grounds. 5Throughout several years of Pew Research studies on global restrictions on religion, the Philippines consistently has displayed a “low” level of government restrictions on religion. In 2012, the most recent year for which data are available, the country had a “moderate” level of social hostilities involving religion, although the Islamist militant group Abu Sayyaf has been active in recent years.